Some of he signs someone don’t love themselves! self abandonment!! 1) Spending more time on the phone, chat, social medias, books, work, children or anything to be distracted and avoid from being alone with themselves, their feelings and thoughts. Basically giving attention to others and abundant themselves and the voice screaming and craving for love inside them. 2) Giving, spending, doing more for others more than for themselves! In other word people pleasing! Abandonment again! Ask yourself, do you do things for people for the sake of joy and helping them or you do it to impress them and receive the approval and attention you are seeking from them and taking away from from yourself?! Because you are not giving it to yourself? And most of the times in that doing, giving, spending you would sacrifice, take away and hurt yourself for others. I watch my mom cook, clean and feed the entire family yet she is hungry and forget to eat herself..
3) You see it physically around them! They don’t take care of themselves, cherish and nourish themselves and anything that belong to them! Their room, their car, their clothing, their appearance, even their children….etc are all a symbol of them abandon themselves! I watched my dad during my entire childhood and adolescence years doing, providing the very minimum joyful things for himself and his children yet buying most expensive gifts for his nephews and other children. He would wear old cloths himself and not shopping and nourishing his body, his closet or his belongings yet purchase most glories gifts for other people to get their approval. Because he never believed he deserve it. Now you might say my car, home, appearance is always organized and clean and purchase best things for myself.. Yet it’s safe to ask yourself, do you do any of those because you love yourself?! Or you do it to impress others?! Do you do it for you or again for others?! 5) And finally you see it in their results! Sabotaging success in business and earning income, sabotaging love and romance (of course), and every other area specifically relationships with people! Why would you let universe take care of you, bring you prosperity, love, joy, happiness when you are busy being angry at yourself, punishing yourself, abandoned yourself and subconsciously believe you don’t deserve it! How would you let people love you, universe love you and provide for you?! You won’t! Self hatred or self abandoned, self punishment could be at different levels…! You might not abandoned yourself to that extend and not all these signs might be there! But there is always room for more self love! In business world they say your net-worth is always equal to your self worth! The real work is not out there but inside you specially for women! The inner work will have you create the life you love and deserve! Ask yourself today how much of what you earn, fulfillment in your relationships with people you love, your relationship with money can reflect the type of the relationship you have with Yourself ?! And what can you do today to improve that?! In “Women In Business” course we do some deep inner work, self healing and self love work that has women heal their relationship with themselves and as a results their relationship with money, wealth, success, romantic relationships and people around them dramatically transform. 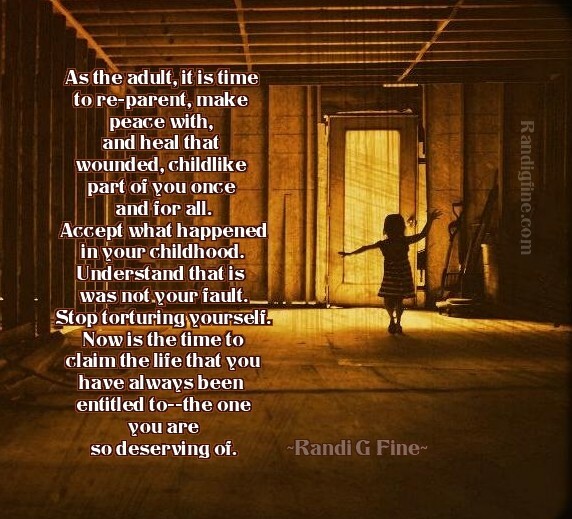 It’s time to release the child and love her deeply. She deserve to live a great life. Remember Love is your birthright! You don’t need to earn it! You are an ethereal soul and deeply loved!